Due to professional interest, but also thanks to my general love for art, I’m always on the lookout for artbooks. They’re good for reference or just ordinary perusal on a rainy day, and I collect just about anything and everything that catches my eye. Several of my shelves, however, are especially dedicated to the realms of fantasy and sci-fi. Over the years, I’ve amassed artbooks featuring masterpieces by the greats such as Frank Frazetta or Brom, but also gaming-related books containing graphics and concept art from games like Guild Wars, World of Warcraft, Assassin’s Creed, Mass Effect, etc. Today, I want to give some love to The Art and Making of Star Wars: The Old Republic, which I was ecstatic to add to my collection this week. Remember, I was initially disappointed that no artbook was included in the retail collector’s edition of the game, but now that I am holding this gem in my hands, I am beginning to understand why. 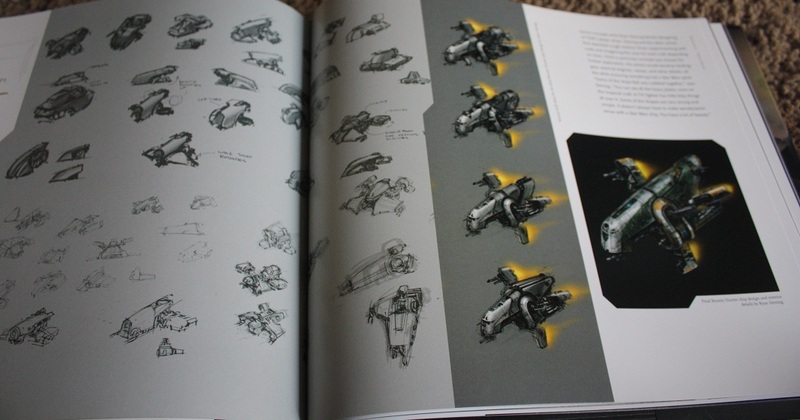 The Art and Making of SWTOR is a masterpiece in and of itself. 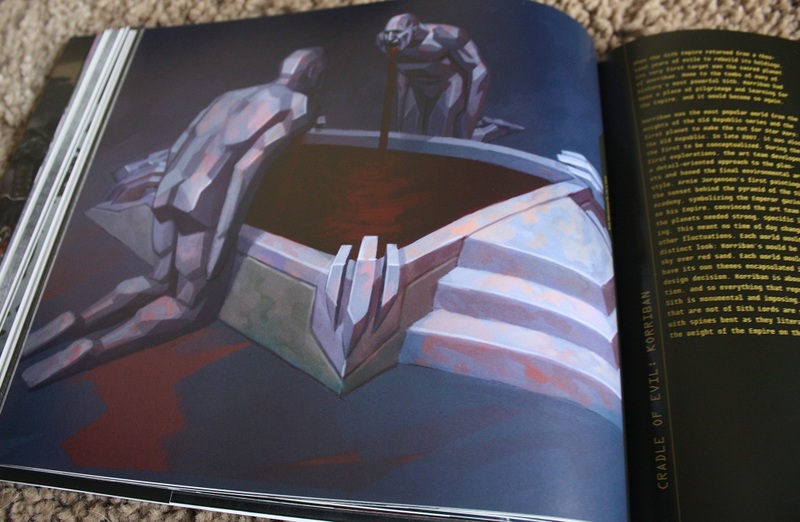 It’s a hefty hardcover of good quality, filled with full-colored images of digital pictures and concept art, and pages and pages of commentary to go with it. Topics covered include the things you’d expect: class design, planets and environments, species, creatures, ships, weapons, armor, etc., etc., etc. 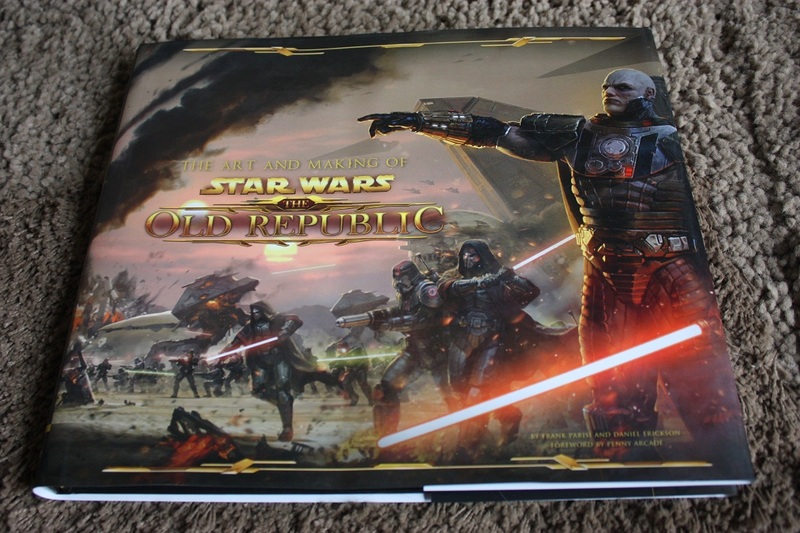 But since this is technically a “Making Of” book as well, you also get developer insights into the creation of the game, everything from commentary on SWTOR’s evolution from its roots in Knight of the Old Republic, to the multitude of challenges BioWare faced when moving into the MMO space. There are also other interesting tidbits on the game’s development, random facts about the game I picked up as I read through the pages. One of my favorites is the section at the back, called “Verbal Cubism”. Did you know that beyond the main dialogue, thirty-thousand lines of alien-speak were recorded for SWTOR? 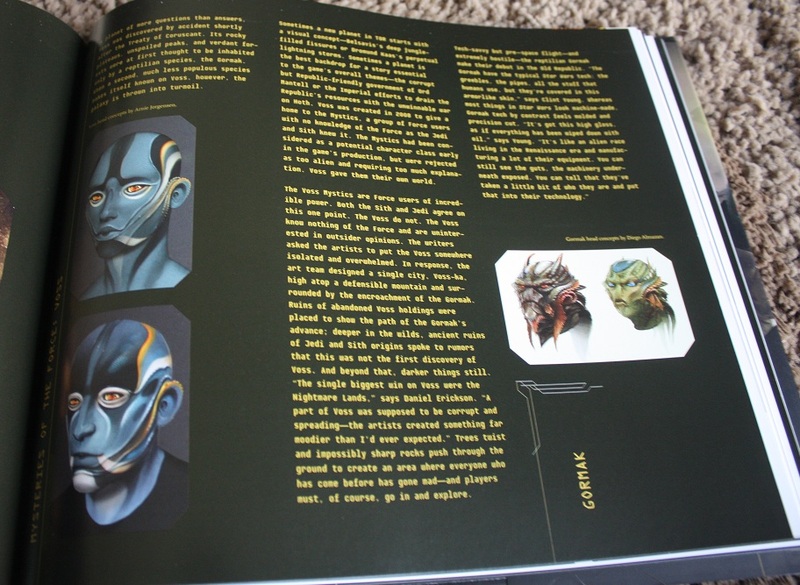 The book states: “To put this in perspective, [that’s] more than the entire script for Mass Effect or both KOTOR games combined. Just in aliens.” Pretty neat. 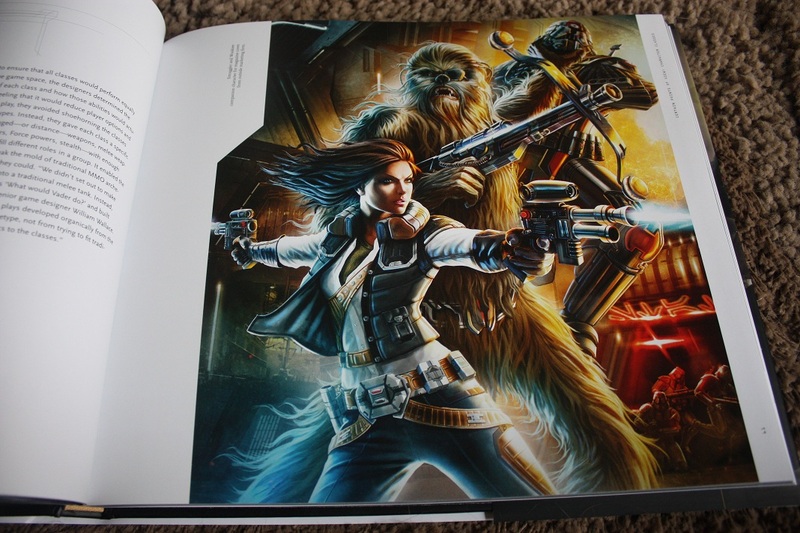 Fantastic overview of one of the best gaming related artbooks I’ve had the pleasure to own. I am loving it. It’s out in the living room now, and I just flip through it every time I walk by. It is a nice big book, and gorgeously put together. Drool worthy indeed! I got it on Saturday. I love this book! I’ve peeled myself away from the pictures long enough to begin working my way through the text portions. Really interesting stuff! Ja I may just have to get a hold of that one. If I may suggest Amazon…they have it for a good price there, as usual. My heart aches. I’m only a few hours removed from the weekend beta, and I feel lost. It was so beautiful. Fleeting, but beautiful. Grats on getting into the SWTOR beta this weekend! It does tug on your heart a little to log in for the first time and see the sights like Coruscant, doesn’t it? Absolutely. There were so many sights that blew me away as I took them in during my play time. Seeing the massive towers of Dromund Kaas against a sky filled with arching lightning; watching the traffic flow above and around me on Coruscant; drinking in the massive statues of ancient Sith lords on Korriban; the environments all left an impression on me. I’ve already been accepted into the next weekend test. I’m already making plans for it – and also storing my thoughts in my head for a blog post once the NDA drops. Overall, I loved my time in the game. I already miss my toons. Yeah, I really hope the NDA would drop soon, or that it even will one day, because I’m dying to write about the game again.